Firefighters on the ground are struggling to fight the Rocky Fire, but pilots who attack the flames from the sky have no easy job either. 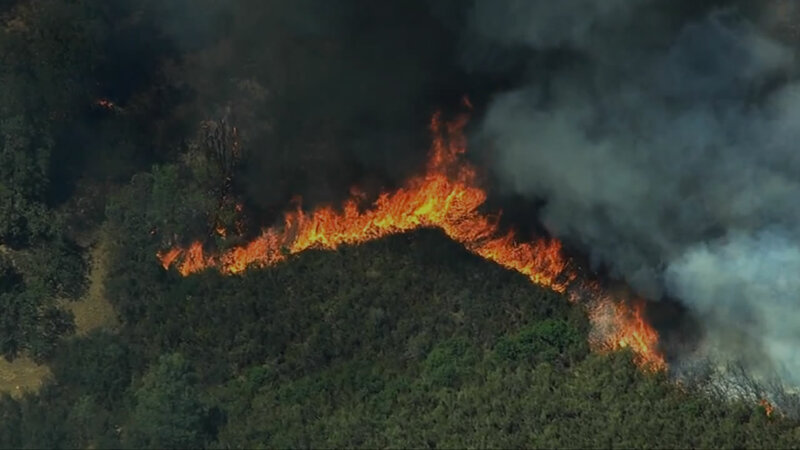 LAKE COUNTY, Calif. -- Firefighters are making good progress on trying to contain the wildfire burning near Clear Lake in Northern California. The Rocky Fire has burned 69,600 acres -- that's nearly the size of Fresno. It is 40 percent contained, 43 homes, and even more out buildings were destroyed. Nearly 7,000 structures remain threatened and thousands of people are being kept from their homes. Firefighters on the ground are struggling in heat and rough terrain, but the pilots who attack the flames from the sky don't have an easy job either. 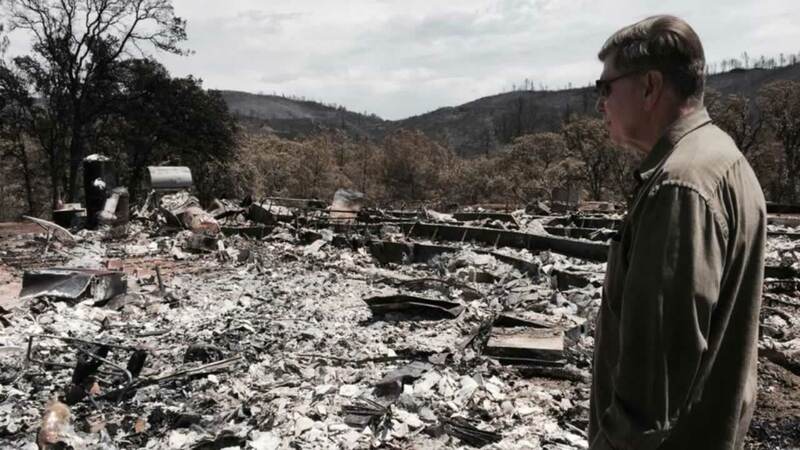 ABC7 News reporters are on the ground covering the massive Rocky Fire that's destroyed dozens of homes and prompted more than 13,000 residents to evacuate. The wildfire is burning in three counties -- Yolo, Colusa, and Lake counties. At the small Sonoma County Airport, pilots are flying constantly in and out of the danger zone. The Cal Fire pilots have been flying seven-hour shifts, ever since the Rocky Fire began. Many are happy and relieved progress is being made, but the historic battle against this fire is far from over. Cal Fire air tankers are returning to base after eight straight days of fighting the fire. Veteran pilot Bob Valette says in his 40 years of doing airdrops, the Rocky Fire has been the worst and called it an inferno with a mind of its own. "It's a big fire. That was one of the fires that basically did what it wanted to do! It was really hard to corral," Valette said. These planes could be the unsung heroes of the fight against this wildfire. One former military aircraft used to chase submarines now drops up to 1,200 gallons of retardant. The retardant is red so pilots can track their drops, but wind and smoke can work against the tankers. Chris Juresak is air tactical supervisor who flies a small plane to control the airborne battle and direct the large DC-10 jet airliners, which can drop 12,000 gallons on the blaze. "Sometimes you have two, three, four airplanes up and multiple helicopters. And you're just trying to make sure that everyone is safe up there," Juresak explained. It only takes two minutes to refuel planes with retardant before they're back in the air. "It's cost taxpayers a lot of money, but we've saved a lot of homes, we lost homes and outbuildings," Valette said. The air fight to stop this fire begins again at sunrise. Jerusalem Valley area east and west of Soda Creek, Bonham Rd, Double Eagle Ranch, Quarter Horse Ln, New Long Valley Road, homes along Highway 20 corridor between New Long Valley Road and east of the county line, Mustang Court, Bronco Court, Sunset Court, Morgan Valley east of Bonham Rd, Canyon Rd, June Bug Rd, Cantwell Ranch Rd, Sloan Ranch Rd, Sky High Ranch Rd, Rocky Creek Rd, Dam Rd from the gate to the dam, Grizzly Canyon, Long Branch Drive, Lance Rd, Cougar Rd, Red Rocks, Meridian Rd, Antelope Rd, Mule Skinner Rd, Flint Look Place, Moccasin Rd, Roundball Rd, Watertrough Rd, Grigsby Canyon, Lucky Canyon, Remington Canyon, Walker Ridge, Walker Ridge Rd, No Guns Rd, Meriann Drive, Bear Valley Rd from Highway 20 to Wilbur Springs Rd, Wilbur Springs Rd and Morgan Valley Rd X Butte Creek Rd, Ogulin County Rd and Spring Valley, Paradise Canyon, New Long Valley Rd, Old Long Valley Rd, Salt Canyon, Indian Hill Rd, Flaming Hills Ln, Benmore Canyon, Red Rock Rd, Red Rock Court, Round Mountain Rd North West of Highway 22, Fern Way, Juniper Way, Holly Way, Golden Red Way, Shasta Rd, Cougar Rd, Jeep Trail, Smith Ln, Pueblo Trail, Quail Trail, Ogulin Canyon Rd, Meadow Creek Rd, Cache Creek Rd, Wolf Creek Rd, Spring Valley Rd, Riverview Rd, Rocky Ridge, Chalk Mountain Rd, Lakeview Campground, Cache Creek Winery, Noggle Winery, Elm Way, Dogwood, Cedar, Blue Berry, Acacia Way, Acacia Street, Doe Trail, Madrone Way, Peach Way, Quince Way, Redwood Way, Sequoia Way, Tamarack Way, Weeping Willow Way, Yucca Way, Coyote Way, Elk Way and Fox Way. All areas including east of Hwy 29 at Raita Rd east of Hwy 53 north to Hwy 20, Clearlake area east of Highway 53 from Dam Rd to Highway 20, Spruce Grove Rd, Noble Ranch Rd, Black Bass Pass, Spruce Grove Rd to intersection of Jerusalem Grade, Lake Ridge, Highway 53 west to Sulphur Bank Rd along Highway 20. Jerusalem Valley Road is closed to all traffic at Spruce Grove Road. Highway 20 corridor will be closed from Highway 16 to Highway 53, both directions of Ogulin Canyon Road and Highway 16 is closed from Highway 20 to County Road 41 in Yolo County.